Despite numerous disappointments in recent Egyptian releases and no reason on earth to expect any better, I fell for the trailer of 122. It had been touted as that rare thing, after all: an Egyptian horror film, and the first ever in Egyptian film history to make use of 4DX technology. Written by Egyptian screenwriter Salah Al-Goheini, directed by Iraqi award-winning director Yasser Al-Yasseri, and starring Ahmed Al-Fishawi, Amina Khalil, Ahmed Dawoud and Tarek Lotfi, it was simply too intriguing to ignore even as I knew what to expect. The two Egyptian films that immediately come to mind in connection with the horror genre are Mohamed Radi’s 1985 Humans and Djinn, starring Adel Imam and Youssra, and Mohamed Shebl’s 1987 The Spell, starring Mahmoud Yassin and Abla Kamel as well as Youssra. With a story rooted in popular and religious beliefs, Shebl’s is the deeper film, but both use ridiculous effects — smoke machines, coloured spotlights and amplified music — to evoke the fearful djinn. Being typical of the 1980s, however, when special effects could not be much better, they speak to audience expectations of the time. Earlier attempts like Mustafa Gamaleddin’s 1956 The Wax Museum, starring Ismail Yassin and Mahmoud Al-Meligi and boasting nothing more than a walking mummy, could be even more naïve. Yet in films like Youssef Wahbi’s 1945 Hell’s Ambassador, starring Wahbi, Al-Meligi and Laila Fawzi, or Kamal Al-Sheikh’s 1952 House Number 13, starring Al-Meligi alongside Faten Hamama and Emad Hamdi, the filmmakers rely on the drama and characters to generate fear. I walked into the auditorium 10 minutes late to find Amina Khalil’s bruised and bloodied face taking up the whole screen. The pregnant Omnia (Khalil’s character), a hard-of-hearing woman, and her drug-dealing husband Nasr (Dawoud) have just had an accident and she is looking for him at the remote and isolated Al-Hayat Hospital, where she meets a doctor named Nabil (Lotfi). Neither Omnia’s pregnancy nor her hearing condition contributes anything to the plot or action, however. The scene is set rather by a nurse announcing to Omnia and Nabil that the last vehicle is leaving the hospital for the night and then boarding that vehicle. It is then that the scene shifts to the morgue, where Nasr — unbeknown to Omnia, now dead — is about to be dissected by the forensic doctor in charge, Amgad. Played — surprise, surprise! — by Ahmed Al-Fishawi, who played the exact same role in Karim Al-Shennawi’s Gunshot, Amgad happens to be running a human organ trade business with Nabil. Surrounded by body parts in jars, Amgad is extracting some dead man’s liver when Nasr — lying on one of the operating tables — suddenly comes to. A ludicrously implausible dramatic device is used here to allow Nasr, who as it turns out is still alive, overhears the doctor on the phone and so discovers the organ trade business, to look for help using that same own phone: an eyelash lands in the doctor’s eye and he steps into the bathroom to remove it. Nasr calls 122 (the 911 of Egypt) only to discover that he doesn’t know where he is and can’t remember his national ID number. 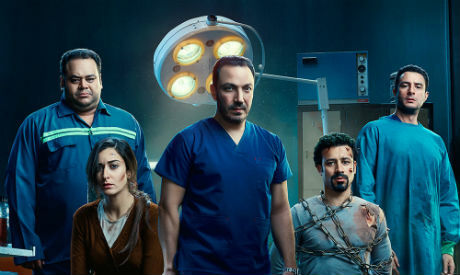 A scene that was supposed to be horrific ends up being comic as the two criminal doctors, having discovered that Nasr is alive, come to blows — and Nabil kills Amgad. Through the claustrophobic corridors and rooms of the premises, the chase thus begins, with the dead man who came back to life pursuing the cold-blooded murderer. But the ensuing action, intended to inspire horror and keep the viewer on the edge of the seat, actually generated a torrent of laughter in the audience, who also decried the bad acting and unconvincing dialogue out loud. Here as in Gunshot, a given phrase will be repeated over and over by a given character — Lotfi as the head of the local police department saying “Today was a very difficult day” in the previous film, Al-Fishawi stating that Nasr was killed in his forensic report in this one. In 122, far too many implausible coincidences drive the action forward. Al-Yasseri is an Iraqi filmmaker born in 1985, and his debut feature was the Emirati film On Borrowed Time (2018). He worked on music videos, television serials and documentaries before making it. Al-Goheini is an Egyptian architect and screenwriter born in 1980, and his debut film was 30 February (2012). He wrote the dialogue for Rizk’s Sons (2015) and The Cell (2017). Together they managed to produce a parody of the film they intended. Indeed, on many occasions the film seemed to be making fun of itself. At one point during the chase Omnia explains that she has lost her hearing aid and Nasr has to shout, but as she nods her head she also seems to lose the power of speech. Such moments recalled the horror parody Scary Movie (2000), something that was confirmed by the reactions of a predominantly young audience who, with access to satellite television and the Internet, are unlikely to find any but the most comedic amusement in a “horror movie” of this quality. Sadly, this may not be enough of an incentive for them to keep going to the cinema.